If you’ve ever experienced a water damaged carpet you’ll know that it is arguably one of the worst smells in the world. It offers up an unmistakeable combination of dank mildew and wet dog which permeates just about every room in the house. The trouble is that by the time your carpet gets to this stage it’s usually too far gone to save. So does this means that a water damaged carpet always equals a ruined carpet? Well no not really! – Ascertain where the flood is emanating from. Knowing this will determine pretty quickly whether your carpet is worth saving. Is it clean water from a leaking pipe, or is it dirty water caused by a sewerage back-up or a drain overflow? If your carpet appears to have direct contact from dirty water, then it’s best to remove and discard straight away. If it’s clean water, then you might want to take the actions listed below. – Stem the source of the leak. This may be something as simple as turning off a stop-valve, or alternatively you might need to call out an emergency plumber. – Next take a box cutter and remove the portion of the carpet that contains any wet spots. While this seems like a drastic measure, carpet can easily be patched back in. What’s more it stops the possibility of mildew spreading. Remove and discard the base padding as this is more than likely to be ruined. Next elevate the carpet off the floor. Finally, open doors and windows to let air circulate the room. – For this stage you’ll need some industrial sized fans – These can usually be hired from a good DIY store and they should be facing towards the affected area. Switch them on to high for a minimum of 24 hours but 36 hours is best. For larger properties, drying times may be longer. While drying, you’ll need to keep foot traffic to a minimum..
– It’s important to inspect your carpet after 12 hours of drying time. This is the crucial time when mould spores can take hold and therefore it’s vital to ensure the carpet is dry to the touch. If it is dry, it’s still imperative that all fans are kept running to ensure permanent drying. – Now’s the time to get in touch with your insurance agent. On the proviso that you weren’t at fault, pull out your paperwork and give them the relevant details relating to your water damaged carpet, so they can at least start taking action from their end. – Once the carpet and area is dry, make doubly sure by installing a large portable dehumidifier to eradicate any damp left in the room. It’s advisable to keep this running for a further few days. – Once the carpet and room are completely dry, look to get your carpet patched in and replace your furniture. If all of the above seems a little overwhelming, then why not leave it to the professionals. 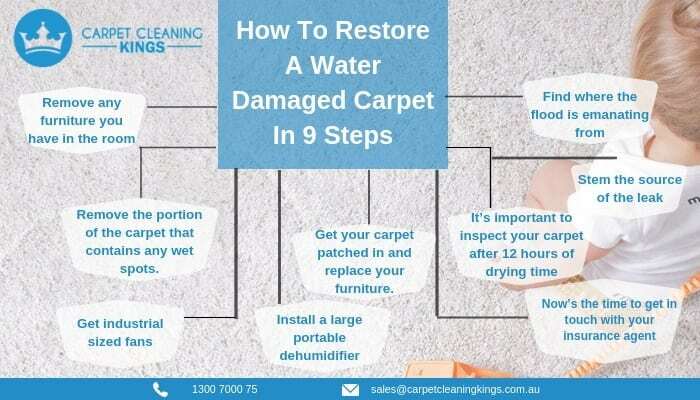 At Carpet Cleaning Kings, we’ve dealt with many water damaged properties in the past and know what actions to take in order to try and save your water damaged carpet. To find out more contact us on 1300 7000 75.